A new study published in Scientific Reports finds that a lower abundance of salmon in a sea noisy from vessel traffic means the whales must forage longer to find their food — stressing their already-endangered population. Orca whales are on a path to extinction within a century unless they get a big increase of chinook salmon to eat, and significantly quieter seas in which to find their food, a new study has found. The research, published in the journal Scientific Reports, evaluated the relative importance of known threats to the survival of southern-resident killer whales, the salmon-eating whales that frequent Puget Sound. An international team of scientists reviewed 40 years of data and the threats of lack of food, pollutants and excessive noise under different future scenarios. A clear finding emerged: lack of food, specifically chinook salmon, was the orcas’ biggest threat to long-term survival, so much so that a 30 percent increase in chinook above average levels is needed to recover the orca population. That increase could be cut to 15 percent if vessel noise also is reduced by half. Otherwise, the populations will continue to decline and there is a 25 percent chance the whales will be lost within 100 years, the scientists found. The findings reflect the unique biology of southern-resident killer whales, which insist on targeting chinook salmon for their diet, virtually to the exclusion of other prey. They also use echolocation — sound — to find their food. Lower abundance of salmon in a sea noisy from vessel traffic means the whales must forage longer to find their food — even as chinook populations also are declining. And if they can’t get enough to eat they burn their own fat, laden with chemicals stored in their tissue, absorbed from pollutants in the waters of the Salish Sea. The linked nature of the threats to orcas means progress must be made on all three fronts, noted Rob Williams, an author on the paper based at Oceans Initiative in Seattle, a nonprofit scientific research firm. The orcas already are in a 30-year population low, with just 76 animals in the J, K and L pods. “The very first thing we should be doing is holding the line, and not increasing threats and harms that are already there, clearly we don’t want to be adding to the problem,” said Paul Paquet of the Raincoast Conservation Foundation in Sydney, B.C., a lead author on the paper. Bob Lacy, a conservation biologist with the Chicago Zoological Society, and another lead author on the paper, said the southern residents are “just holding on; the population is too fragile to withstand any increased threats. 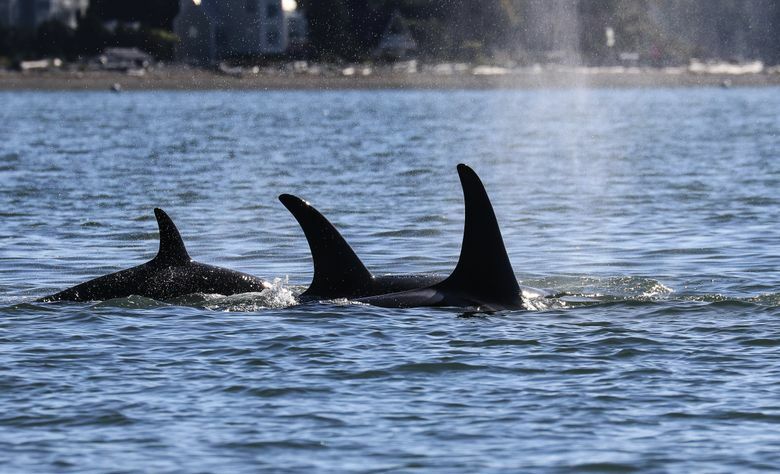 Lynne Barre, Seattle branch chief of the Protected Resources Division at NOAA Fisheries West Coast Region, said the agency is well aware of the orcas’ predicament, as their population — at the lowest numbers since the 1980s — continues to drop. They are listed as endangered under the Endangered Species Act. “We are moving in the wrong direction,” Barre said. The agency is looking for partners at every level — local, state, federal and across the border in Canada, to ease threats to orca survival she said. It’s not a problem orcas might just fix on their own by turning to other prey. While so-called transient killer whales in Canada feast on marine mammals, especially seals, the southern residents will not switch from chinook — the most calories for the hunting effort of any salmon — even when the region’s most prized fish is scarce. “It seems to be cultural, this is what they learned from their mothers, they live in tight family groups and it makes them unique and very special, but it might be a downfall as well,” Barre said. Chinook are listed as threatened under the Endangered Species Act both in the Columbia River and in Puget Sound. Orcas forage for chinook at the mouth of the Columbia in the early spring and again in Puget Sound in the summer, especially on the west side of San Juan Island. Scientists have been studying the whales’ foraging behavior and can see that vessel traffic affects it, she noted. The agency is considering a proposed change in the critical habitat protected for the whales to include the West Coast all the way to the San Francisco Bay Area, to reflect what scientists are learning about how far the orcas travel for their food, Barre said. Also under review is a protection zone that extends three-quarters of a mile offshore of San Juan Island from Mitchell Point in the north to Cattle Point in the south. All motorized vessels would be excluded from the zone to give the whales a refuge from their noise. The proposal from Orca Relief Citizens Alliance and other conservation groups, under review by NOAA since January, received more than 1,000 comments, including suggestions of new approaches to the problem. 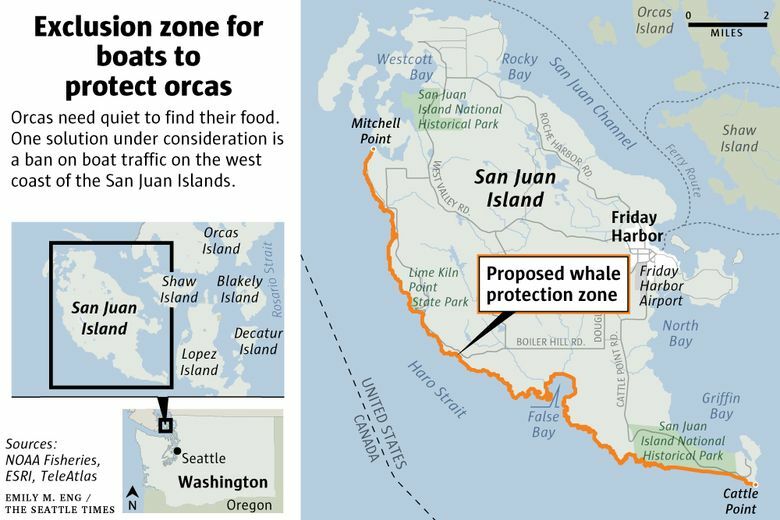 James Unsworth, director of the Washington Department of Fish and Wildlife, even suggested that instead of a fixed protection zone, what is needed is a floating go-slow bubble extending 1,000 yards around every orca as it travels anywhere in Washington’s inner marine waters. Within the bubble, vessel speeds would be restricted to not more than 7 knots on the water. That would be a big increase in the 200-yard, no-approach zone around every orca imposed by NOAA in 2011. Slower travel speeds help orcas by quieting vessel traffic. Some change is already underway on a voluntary basis. The Port of Vancouver, B.C., in a pilot program last summer, asked ships to cut their speed to 11 knots — a reduction to nearly half speed for some vessels — to reduce noise levels in a 16-mile-long area of the orcas’ prime feeding ground. More than 61 percent of ships using Haro Strait voluntarily participated. It’s the kind of measure that perhaps could buy the whales some time and take the pressure off a population struggling to survive, Williams said.